It's been just under a year since we completed this amazing track on the North Island of New Zealand and thinking about it just makes me want to go back and do it again. 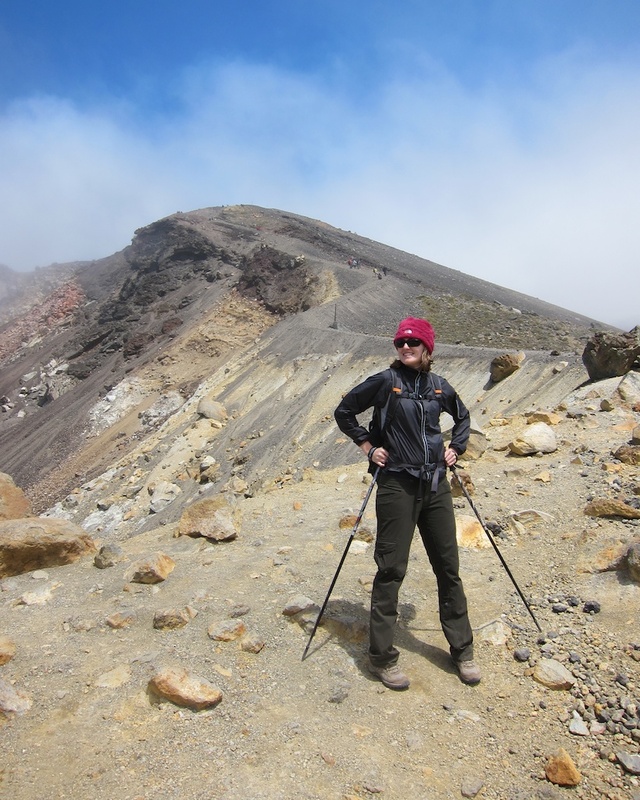 The Tongariro Alpine Crossing is considered one of the most spectacular walks (often called tramps or tracks) in New Zealand, but it's not for the faint of heart. The route takes you between two active volcanoes, Mt. Tongariro and Mt. Ngauruhoe, over the course of 19.4 km (a little over 12 miles) and about an 800+ meter elevation gain to the highest point and a subsequent 1,000+ meter elevation drop to the end point. The track starts out with an easy and steady climb over dirt trails and picture perfect boardwalks to Soda Springs. If it's clear you'll have some great view of Mt. Ngauruhoe, if it's cloudy and misty like it was the day we visited it will just add to the exotic landscape. Enjoy this part of the track, it was by far the most relaxing part of the entire walk. Next up is the Devil's Staircase and it's exactly what it sounds like; seemingly never ending stairs. We saw a couple of folks turn back rather than continue the climb up to the South Crater. It was a hard road, but once we made it up it was worth it. The day we were there offered a unique experience as the mist and fog blocked almost all visibility except for the path with the trail markers. It felt like what I imagine walking on Mars would be like quiet and rocky, except for the whole extreme temperatures and different gravity part. After treking across the relativly calm South Crater things start to get interesting. 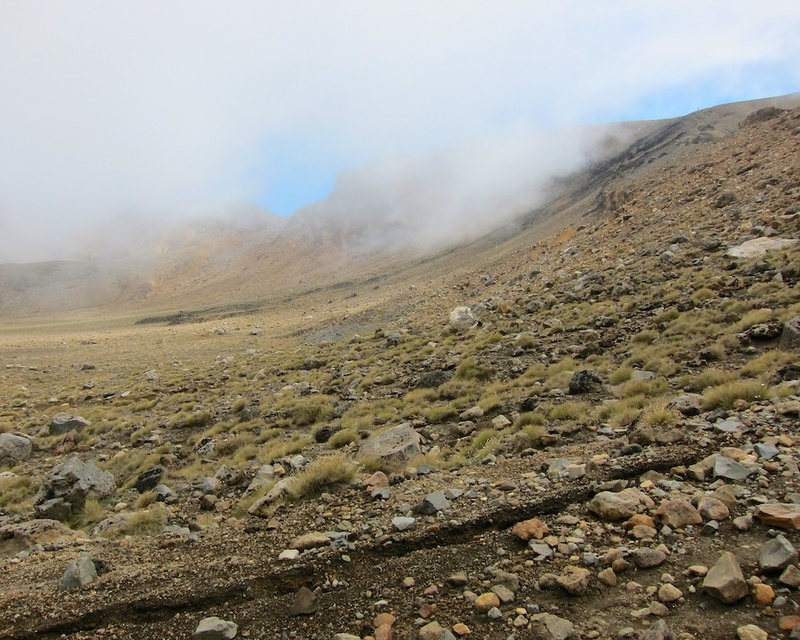 A steep climb up to the Mangatepopo Saddle is followed by a narrow descending scoria covered ridge past the rim of the Red Crater and down to the Emerald Lakes. To be honest, in the conditions we had to complete the Crossing this portion of the track felt rather dangerous. Hiking along a narrow ridge line with low visiblity, strong winds, and rain pelting down it was down right nerve wrecking. However, the feeling of accomplishment after completing this part of the track was pretty darn great and you're rewarded with a view of beautiful jewel colored lakes and an easy walk across the Central Crater. A short but steep climb awaits you at the edge of the crater, but then it's all downhill from there. Don't let that downhill fool you though. While it rewards you with gorgeous views of Lake Rotoaira, Lake Taupo, and a nice spot to stop and sit at the Ketetahi Hut it, like the Devil's Staircase it will feel like it goes on forever. Also, a note of caution on your descent to the Ketetahi car park, the route is beautiful and there is much to see but don't dawdle too long or you may find yourself running for the last 4+ kilometers to make sure you catch your bus on time! 1. First, to get to the start of the track you have to arrange transportation to the Mangatepopo car park and a pick up at the end on Ketetahi car park. Most lodging in the area will have some way for you to arrange transportation, often by bus. 2. Consider the times of your drop off and pick up carefully, we completed the track in about 7 hours but we ran for the last 4km in order to make our bus. We walked at a moderate pace, took our time during the steep climbs and only stopped to take pictures, eat an occasional snack, use a restroom, and adjust our gear. We never sat down to a proper or lunch or got to take as many pictures as I really wanted to. Overall, it felt like rushing doing the hike in 7 hours. 3. Really take a moment to consider your physical and mental abilities to complete a 19.4km track with variable terrain and potentially changing weather. I'm admittedly not in optimal athletic shape, have some knee troubles, but overall I'm pretty healthy. I made it, but there were points where I felt like I couldn't go any further (on the Devil's Staircase, the climb down to the Emerald Lakes, and the never ending downhill to the Ketetahi car park). The day after I was walking very gingerly and not too keen on climbing any stairs. Consider your own abilities before attempting the Crossing, it's a pretty tough ride. 4. Be prepared! Most all guides and descriptions about this hike will tell you how important it is to be prepared with the proper gear and supplies. Our treking poles were invaluable on the the sketchy terrain and windy climb up the Mangatepopo Saddle, it's possible that they may have saved me from getting blown over the edge into the misty abyss of the Red Crater on more than one occasion. We also brought variabe and layerable clothing, from a tank top and shorts to full rain gear, we used it all on the Crossing. 5. Its not uncommon for transportation and guided trips to be canceled due to poor conditions, so plan accordingly and spend at least two days in the area. Our transportation got canceled and then reinstated twice, causing us to eventually miss our bus in all the confusion. However the awesome staff at Chateau Tongariro helped us out and drove us to the start of the track. If your transportation does end up getting canceled, I would highly recommend the short hike to Taranaki Falls. It's a gorgeous walk to a beautiful waterfall, followed by excellent views of both Mt. Tongariro and Mt. Ngauruhoe.